The Sphynx is a breed of cat. It does not have much hair or fur on its body, but it is not truly hairless. The skin is soft because it has a fine layer of down. It may or may not have whiskers. The skin is the color the fur would be. This cat has all the same coat patterns found on other cats, such as a calico or tabby. The pattern is just seen on the Sphynx skin. Because they have no coat, they lose more body heat than cats with fur. This makes them feel warm when touched. They also like to seek sun or warm places because they are naturally cold. The lack of hair can cause health issues with kittens in the first weeks of life because they can get sick with respiratory infections. Good breeders should not let their kittens go to new homes without being at least 14 weeks of age. This is to make sure the kitten is mature enough to cope in a new environment. Sphynxes are friendly and not shy. The Sphynx was not the first hairless domestic cat. Some were seen in other places around the world for at least 90 years. 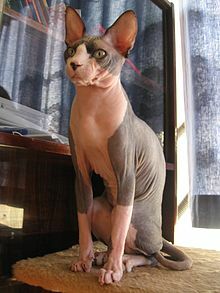 The Sphynx breed began in 1966, in Toronto, when a hairless kitten, named Prune, was born to a black and white shorthair cat, named Elizabeth, in Ontario, Canada. The kitten was mated with its mother, so one more naked kitten was born. Along with a few naked kittens found later, the hairless breed began. The first breeders did not know much about cat genetics and they had some problems. The gene pool was small and many kittens died. Many of the females had seizures. Sphynxes are friendly and not shy. They have a lot of energy, intelligence, curiosity, and love for their owners. They are one of the more dog-like breeds of cats. They run and greet their owners at the door and are friendly when meeting strangers. Even though Sphynx cats do not have a coat to be brushed, they do need a bath once a week to wash off oils that get on their skin. They should not be left outside and need to be an indoor cat. First, sunlight can give them a sunburn. Secondly, they cannot keep warm when outside, so some owners dress them in warm clothes in the winter. ↑ Irvine, Angela; Trevor, Dawes; McAuliffe, Michael; Bowd, Neil (2006). Sphynx: The Australian Experience. OzSphynx. p. 14. ISBN 9780646473093. ↑ "Cat breed directory: Sphinx". Animal Planet: Animal Discovery.com. 15 August 2014. Retrieved 15 August 2014. ↑ 3.0 3.1 Dr. James Thoene (2014). "Sphinx History". Beetlebrox Sphinx Cattery. Retrieved 15 August 2014. ↑ "Animal Planet : Cat Breed Profile : Sphynx". Animal.discovery.com. 2008-09-10. Retrieved 2010-10-26. This page was last changed on 24 October 2017, at 10:17.